I won’t lie, having a garden is town is very fortunate but you quickly make ennemies. Squirrels for example, I love them dearly, they are cute and clever, and some of you already know about the baby I rescued not long ago. But they love tomatoes, strawberries and…basically everything they can put their little paws on. They will pick it, chew it, and depending their mood, take it back to their nest or drop it. Before we had our cat Vegas, I used to find half eaten tomatoes on the floor every evening after work and felt like crying every time! A net would do the trick, but a cat is prettier and much more efficient. Just so you know, she isn’t a savage and doesn’t kill them. She is too clumsy for this, bless her. But she does the trick and they’ve left our tomatoes growing in peace. 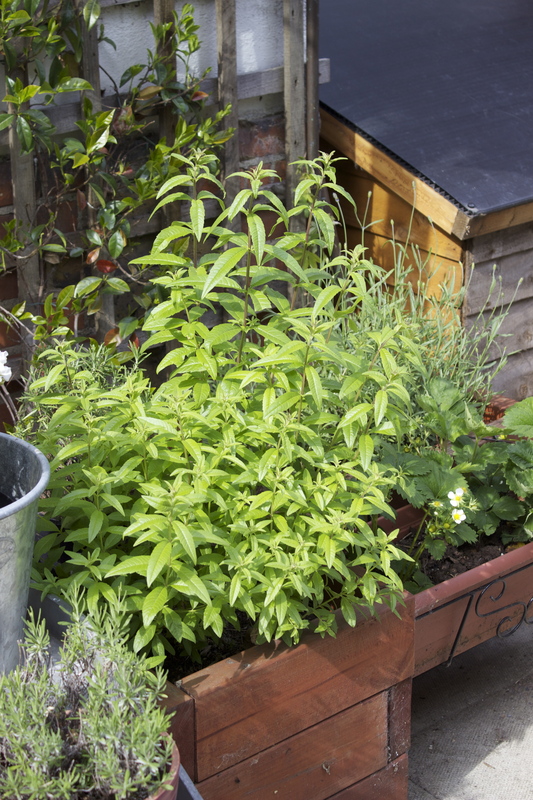 You can buy tomato plants, making sure to re-pot them in a bigger pot, keeping them in a green house or on a window seal for a few weeks before planting them outside in a big pot with compost. 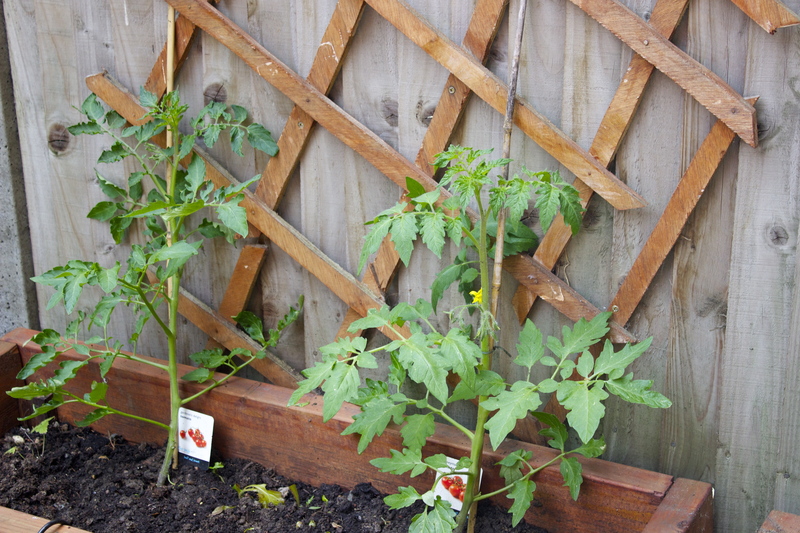 You can also keep some seeds from these amazing tomatoes you bought and loved and keep the seeds in kitchen paper in a dry and dark place until spring to sow them. Or again, if you have squirrels eating your tomatoes, they will squeeze the seeds out and spread them all over your pots, so every year there will be tomato seedlings popping their heads out of every single pots you own. Which is great. Tomato plants are greedy, the more you water them, the more they’ll need. So be firm from early on, and water them only when the leaves look sad otherwise you’ll break your back at carrying water, and your tomatoes will be watery. 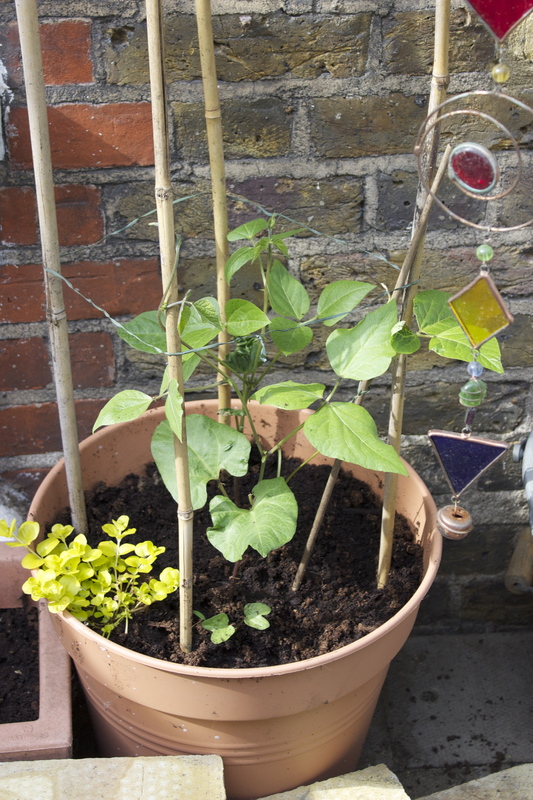 Beans are great, this year it’s runner beans for us. They climb everywhere and have pretty flowers which transform your garden in a little jungle. Let them do as they please but water them well. Strawberry plants are a bit annoying until they are a few years old. 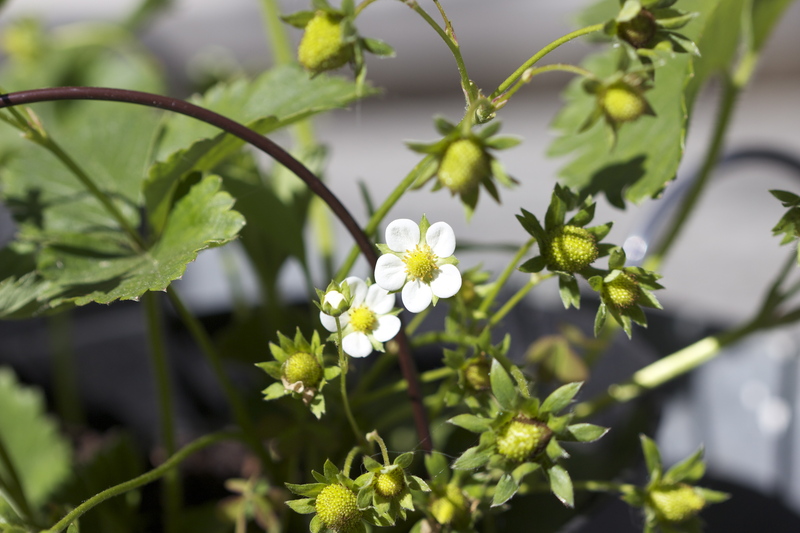 Before that, you should cut away most of the flowers otherwise you will never get a fully grown berry. After year 2, they can produce many more fruits, but to be honest, you will need a few dozens plants to get a full bowl of strawberries! Rhubarb? 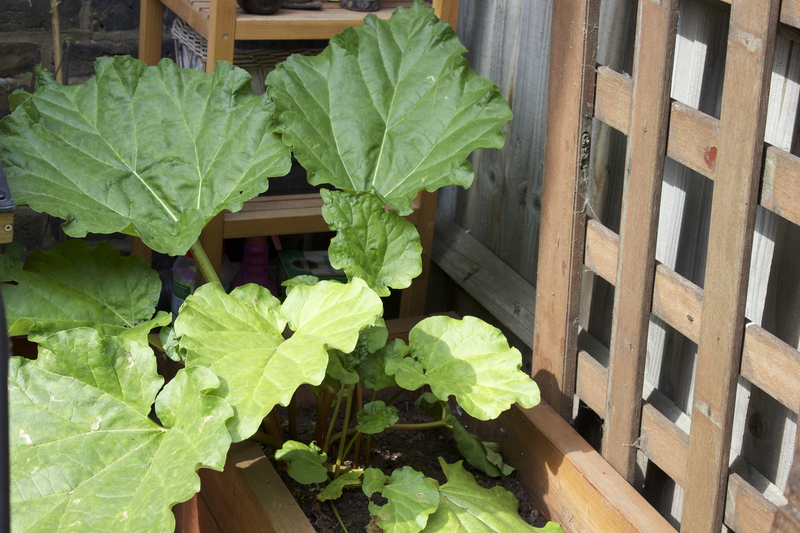 Our rhubarb is looking good this year, it’s 3 years old now and I pick sticks every other week. I’ve never had rhubarb in my garden in the South of France-too hot- so this is really satisfying. Let’s do a relish for pork- oh wait, I’ll go and pick some rhubarb! There, done. Amazing relish. Have you ever made the one from Ottolenghi? A pure marvel! 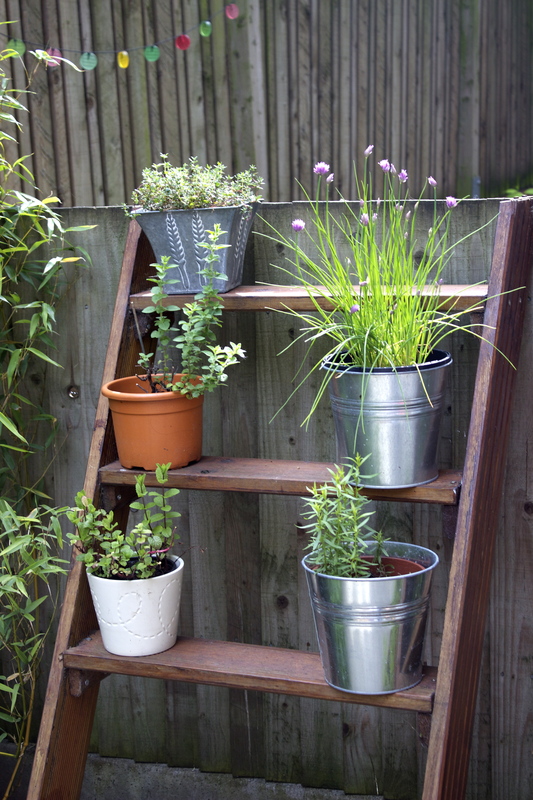 As for the herbs, you need them all, and they should be in pots. I planted the sage in the big patch and I have to trim it down twice a year otherwise it would invade the garden. And I am not even going to start about mint. Do keep it in a pot. Except if you’re a mint addict like my cat! 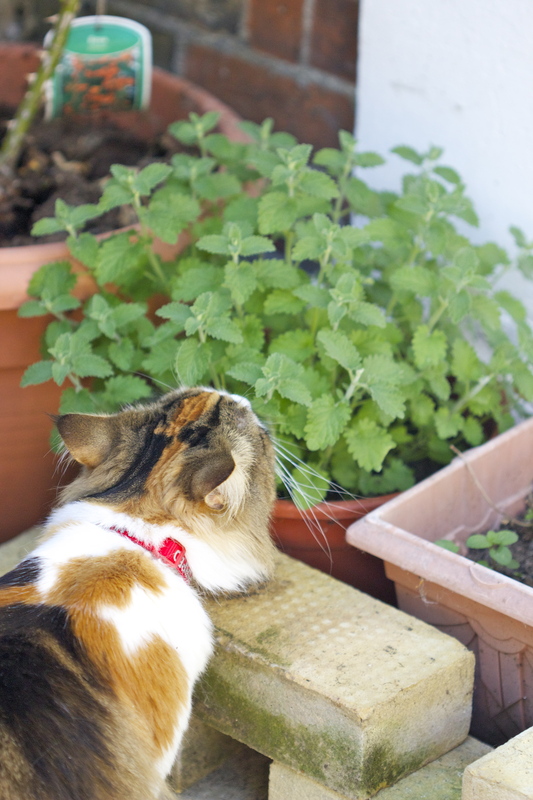 She has her very personal pot of catmint, or Nepeta, with the chemical nepetalactone that binds to her olfactory buds and trigger a sudden surge of… ecstasy? This entry was posted in DIY, Foraging. Bookmark the permalink.